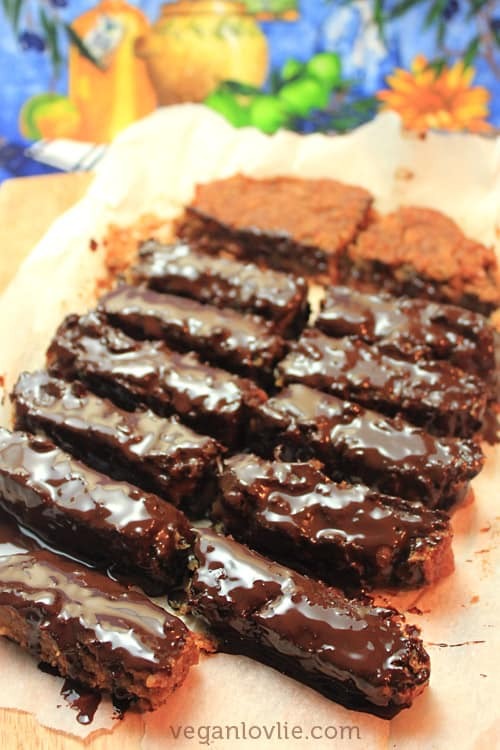 Pre-workout flourless gluten-free vegan protein bars recipe with a luscious coating of dark chocolate. Protein bars without nuts. Valentine’s day is almost round the corner. Not that I actually look forward to it or do anything special, I don’t actually do anything on Valentine’s day. But at least, I think the day isn’t complete without a little chocolate treat! According to recent studies, dark chocolate, or more so the flavanols present in chocolate, are actually very beneficial for the body as a pre-workout snack. These flavanols reduce muscle fatigue by 30% and increase performance by 50%. But don’t go eat a whole block, only a little amount (about 5 g) is recommended before exercise. I am a serious chocolate lover and I only buy dark chocolate. I’ve never actually paid much attention in having a little bit of chocolate before exercise. But if this can improve my exercise performance, then I’m in! And pre-workout vegan protein bars is something that Boyfriendlovlie has been requesting for a long time to assist with his training. 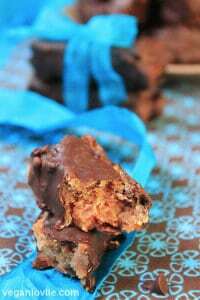 Although I made this as a pre-workout protein bar, it was so good that I actually had it anytime I wanted a sweet healthier snack. Boyfriendlovlie absolutely loved it too! When I make little sweet snacks, he usually doesn’t remember that they are there to be eaten (until I remind him) but for these vegan protein bars, he came looking for them by himself! They definitely appealed to him! Make sure you use dark chocolate that is above 70% as lower than this contains too much sugar and is not as effective. These vegan protein bars without nuts are a little treat that will appeal to young and old alike. A chocolate covered protein bar that kids can enjoy and adults can fill up on for a protein-rich snack. Soak the dates in some hot water for about 10 minutes or until soft enough to blend to a smooth paste. Preheat oven at 350 degrees Farenheit (or 180 degrees Celsius). Mash the beans to a paste, I used a hand blender which left a few small chunks in. It is fine to use a blender too but pulse to break into small chunks first. 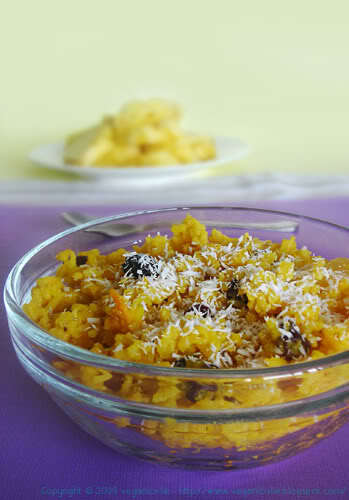 Remove dates from water, remove pits, chop into small pieces and add to the blender. Add the rest of the ingredients to the blender and blend until all ingredients are well mixed. Lay a sheet of parchment paper on a rectangular oven dish. Pour mixture in the dish and smooth out evenly. 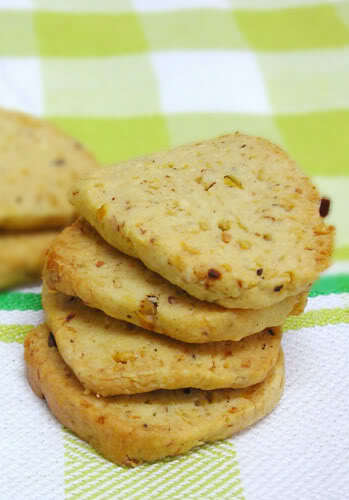 Bake for one and a half hours or until a toothpick inserted in the middle comes out clean. Lift parchment paper and remove from pan. 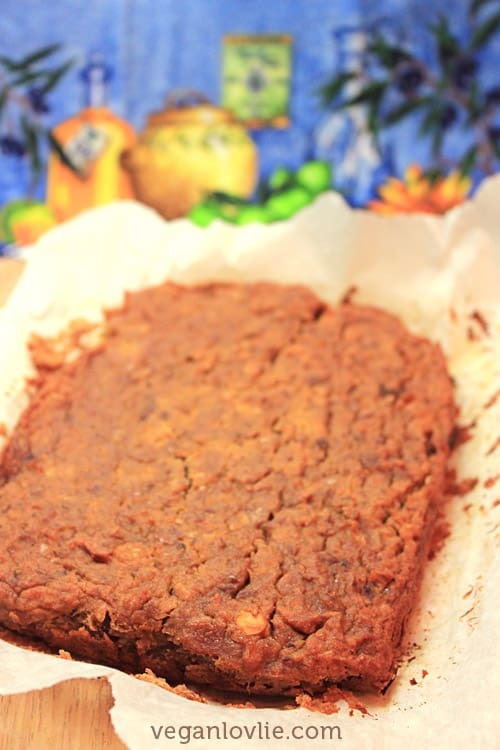 Leave cake onto the parchment paper and cut into logs or squares, whichever shape you like. Melt about 150 g chocolate in a double boiler. You can make your own by using a smaller pan inside a larger one. Fill the larger one with enough water so the smaller pan floats. Place chocolate in smaller pan and heat the water until it melts. Coat each log on the three sides. Meanwhile you can melt the remaining 50g of chocolate. Remove and turn the uncoated side up. Coat with a layer of chocolate. Put back in the freezer for 15 minutes. Then remove and store in the fridge. A flourless gluten-free vegan pre-workout bar with a luscious dark chocolate coating. Melt about 150g chocolate in a double boiler. 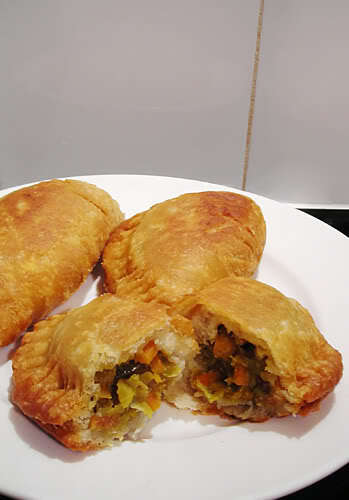 You can make your own by using a smaller pan inside a larger one. Fill the larger one with enough water so the smaller pan floats. 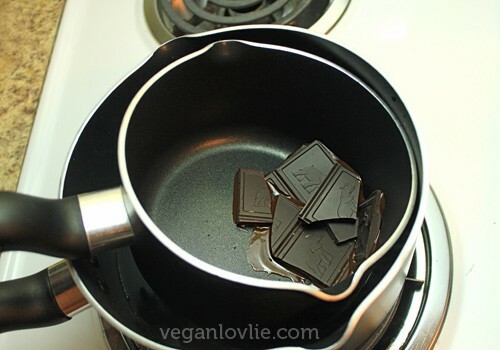 Place chocolate in smaller pan and heat the water until it melts. 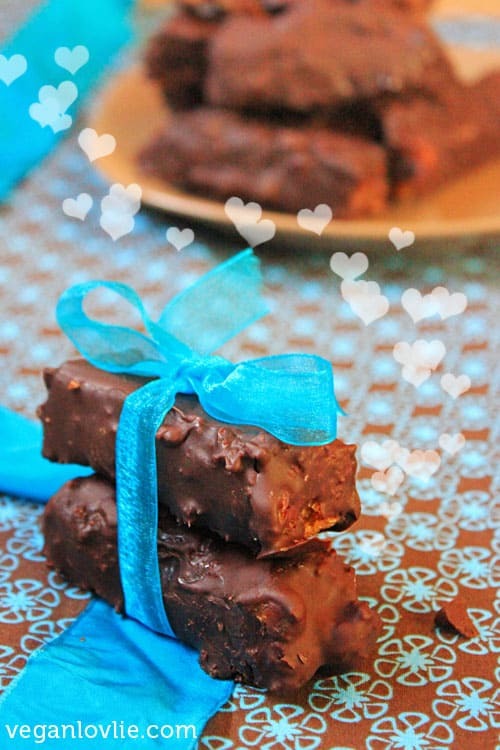 Love this Vegan Nut-free Protein Bars Recipe? Don’t forget to pin for later. Previous Post: « Closed: Zinio Digital Subscription Giveway! Holy Moly, those look gooood! Love those for a pre-workout snack! I am pretty excited to try these out. Always looking for a pre-workout snack that isn’t a banana. wow that’s looks awesome !